"I like blended and frozen drinks, so after trying the limited edition Kahlua® pumpkin spice holiday flavor I decided to see what I could come up with. It is delicious! Please use heavy whipping cream. It is available in small pint-sized containers. It is not much, but it adds a necessary creaminess to the drink texture. The pumpkin puree also adds to the pumpkin flavor. Feel free to garnish as desired with additional pumpkin spice, whipped cream, or both. Enjoy!" 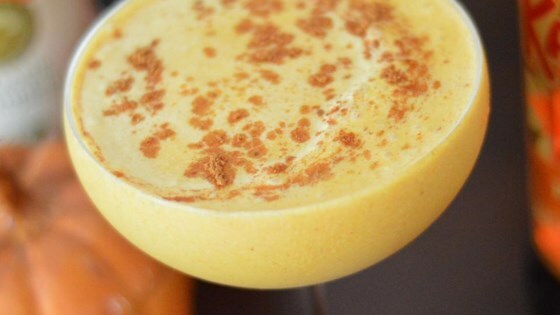 Combine cream, milk, pumpkin puree, pumpkin liqueur, and pumpkin pie spice together in a blender. Add ice cubes. Blend until smooth, 30 to 45 seconds. See how to make the perfect cold-weather cocktail.